"Normal brain function seems to rely on precise control of gene expression. in the expression of key genes lead to widespread dysregulation of normal neural function." Catherine Dulac, PhD, is a Howard Hughes Medical Investigator at Harvard University’s Department of Molecular and Cellular Biology. She joined the Harvard faculty in 1996, and was promoted to associate professor in 2000 and full professor in 2001. She was the Chair of the Department of Molecular and Cellular Biology from 2007 until 2013. 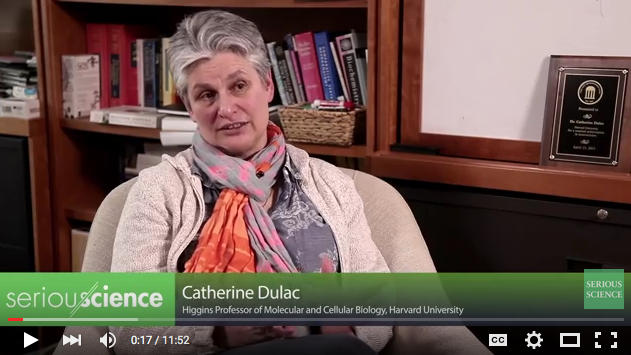 Professor Dulac grew up in France and earned a Ph.D. in developmental biology from the University of Paris in 1991. She is well known for her work on the genetics and molecular biology of chemical signaling in mammals, particularly pheromones, that influence social behaviors. More recently, her lab has been studying genomic imprinting, an aspect of molecular genetics that influences mental function and behaviors. In genomic imprinting, the epigenetic regulation of genes coming from the mother and father are different—with implications for proper brain development. Her lab’s recent work uncovered 160 imprinted transcripts in the adult and developing cerebellum, including 41 novel and independently validated imprinted genes, and revealed new levels of complexity of genomic imprinting throughout the brain, with important implications for understanding the normal and the diseased brain. "Genomic imprints are molecular traces on the chromosomes that are inherited from the parents and that affect gene expression, such that one parental allele is expressed less than the other. These are epigenetic changes that are inherited from the parental gametes." "[A] great percentage of known imprinted genes were found to be expressed in the brain and more specifically in the specific areas of the brain with functions ... such as homeostasis, social behavior and motivation." In brief, the idea is that specific brain regions, and maybe specific neuronal types may need the right dose of the right gene at the right time. Our data has shown how certain paternal and maternal alleles make vastly different contributions to brain development during this dynamic process. "Remarkably, we found that a number of imprinted genes are only imprinted in the brain, or in specific brain regions or during certain stages of development." "Our hypothesis is that genomic imprinting is important for the brain in order to tightly regulate the dosage of certain key genes. It has indeed been shown that the brain is sensitive to the dosage amount of certain genes." "We think that this is what's happening with all these imprinted genes. then you might have a problem with how the brain develops." " If we know the normal imprint then we can try to understand what is dysregulated in specific disorders and what are the agents that trigger those anomalies." "It is well known, for example, that in an in vitro culture, genes can lose some of their imprinting status. This is a problem with in vitro fertilization where abnormal genomic imprinting can arise when you put cells or embryonic cells in culture." Q: I’m excited about your new research in genomic imprinting. How did your past work in pheromone signaling lead to this area of research? My main interest is in mechanisms by which the brain controls social behaviors. In mice, pheromones trigger social behaviors, but pheromones are very species-specific and some animals, like humans, for example, are probably not very sensitive to chemical cues for their social behaviors. They are more sensitive to visual cues or auditory cues—each animal species detects a number of social stimuli through specialization of sensory organs. But the circuits inside the brain that process signals and trigger social behavior, those are very likely to be highly conserved from one species to the other. Using the mouse as an experimental system, one can make genetic modifications to challenge hypotheses, and it happens that mice are sensitive to chemical cues. So that's how we started to look at pheromones—with the idea of better understanding mechanisms by which the brain regulates specific behaviors, in particular social behaviors. And indeed, recently we discovered, for example, the brain circuit that drives parental behavior both in male and female mice. I really love this story because in mammals mom is the primary caregiver and the males are kind of on the side, but actually both the brains of males and females have a set of neurons that, if disabled, renders the animals completely unable to care for their young. But if you activate these neurons artificially, even the male that had been aggressive towards infants will now start to groom the pups. That's the type of understanding we want to have in terms of social behavior—what are the triggers for social behavior and what are the brain areas that enable animals to interact with each other. This is at the core of the better understanding not only of animal behavior but also human behavior and mental disorders. In humans, the strongest manifestation of mental disorders in human are defects in social interactions, and that's true for autism, that's true for depression, for schizophrenia, for all sort of mental disorders. We think there is a very strong fundamental component to our research that potentially could be of use for understanding the basis of these human disorders. Q: How did you move from this to genomic imprinting? I became very interested in the field of epigenetics, in which scientists attempt to understand mechanistically how specific events associated with the control of gene expression enable a transient signal to have a lasting effect on gene expression that well outlasts the disappearance of the original stimulus. Modification of the DNA or the chromatin such as changes in DNA methylation can presumably have a strong impact on brain function, and therefore on the control of behaviors. There is still a large degree of skepticism among molecular biologists studying the fundamental basis of epigenetics in simpler experimental systems such as the yeast or cell lines about how epigenetic principles may apply to the brain, but fundamentally, I found the problem fascinating: how does a transient event reach the DNA and have long-lasting effects on the brain? This is how I became interested in genomic imprinting because with genomic imprinting there's no doubt that it involves core epigenetic principles. Genomic imprints are molecular traces on the chromosomes that are inherited from the parents and that affect gene expression, such that one parental allele is expressed less than the other. These are epigenetic changes that are inherited from the parental gametes and that are stably conserved across cellular generations in many tissues of the offspring. When I became interested in the phenomenon of genomic imprinting, most of the work dealt with the control of embryonic development, and that brought the discovery of a number of imprinted genes. But as it turned out, there seem to be many imprinted genes in the brain as well. When Chris Gregg, now a faculty at the University of Utah, was a postdoc in my lab, we decided to have a systematic look at imprinted gene expression in the brain. Remarkably, when we looked in detail at gene expression datasets in the brain, it turned out that a great percentage of known imprinted genes were found to be expressed in the brain and more specifically in the specific areas of the brain with functions we are specifically interested in, such as homeostasis, social behavior and motivation. This brought full circle the idea that epigenetic regulation of genes through the phenomenon of genomic imprinting may have deep implications for understanding the control of brain development and behavior circuits. With genomic imprinting, the idea is that epigenetic information inherited from the parents lead to long lasting regulation of gene expression in the brain. This widespread expression of imprinted genes in the brain really intrigued us and we wanted to know more: were there new imprinted genes in the brain that remained to be discovered, and were there differences in the repertoire of imprinted genes according to the brain area or the brain developmental stage. In 2010, Chris and I published a study suggesting that the number of genes found to be imprinted in the brain was higher than people had expected. Interestingly, the form of imprinting that we identified was a bit different than what had been reported before. Indeed, it was assumed that for most imprinted genes, either the paternal or the maternal allele was fully silenced and the other allele was solely expressed. However, we found that imprinted regulation did not necessarily lead to an “all or none” uniparental expression, but that instead, many imprinted genes displayed biases in maternal or paternal gene expression. Q: It strikes me that the existence of parentally-biased gene expression perhaps will add a whole new layer of potential molecular causes of abnormal neurodevelopment. Normal brain function seems to rely on precise control of gene expression. This has been shown now for a number of brain disorders, such that slight increase or decrease in the expression of key genes lead to widespread dysregulation of normal neural function. Similarly, the imprinted regulation may provide a tight control of expression through the regulation of parental bias. We found that the parental bias of many imprinted genes was highly dynamic from one brain region to the next, and from one developmental stage to the next. Q: Why is it that these vitally important mechanisms are just being discovered now? The reason these genes had not been found before is that nobody had the experimental tools to discover parental biases in gene expression. It's only with the recent development of the new generation sequencing technology that the sensitivity and statistical power required to identify allelic biases was reached. Our results suggested already in 2010 that there's something really profound and unique happening with genomic imprinting in the brain. In the new study we just published, we were able to continue this work and this time expand our analysis to multiple brain regions as well as non-brain tissue, also based on Bayesian statistics and with independent experimental approaches. Remarkably, we found that a number of imprinted genes are only imprinted in the brain, or in specific brain regions or during certain stages of development. Q: What are some implications of these findings? This is a very important question that we have started to investigate using genetic tools. One concern obviously is that a lot of very interesting phenomena may be discovered in the brain but until they are proven to be functionally important, that is, that if disrupted, brain function is abnormal, then it might just be some oddity of gene regulation with no clear functional consequences. In a set of experiments, we removed only in the brain one of the two parental copies of a particular imprinted gene that we discovered, Bcl-x. This gene has a paternal bias, meaning that about 60% of the gene is expressed from the paternal allele and 40% from the maternal allele. A 40/60 percent parental bias is not impressive. This is very far from 100% from the paternal allele and 0% from the maternal allele identified in some previously known imprinted genes. So it's a small bias. The question is, is such a small bias physiologically relevant? Our hypothesis is that genomic imprinting is important for the brain in order to tightly regulate the dosage of certain key genes. It has indeed been shown that the brain is sensitive to the dosage amount of certain genes. Let’s take for example the gene UBE3A, which is a very well-known imprinted gene. If you have a maternal deletion of UBE3A, then you have Angelman syndrome. But if you should put extra copy of UBE3A, then you generate autistic behavior. So if you see too much or too little of that gene, you have a problem. What you need is really to be in the middle. We think that this is what's happening with all these imprinted genes. They have a very tight regulation and if you have too much or too little, then you might have a problem with how the brain develops. Q: Do you have other examples? We were able to test this hypothesis specifically on one of the new imprinted genes that we found, Bcl-x, which is an anti-apoptotic gene. We found that indeed, if you remove the paternal copy of the gene, which is the most highly expressed allele, then a robust phenotype can be identified in the brains of the paternal mutants—it is 15 to 20 percent smaller than the brains with maternal deletion of Bcl-x, and than control brains. There are fewer of certain types of neurons, so the defect of paternal mutants is really profound, and none of this is observed if you remove the other parental copy, the maternal copy. Q: Wow, what power imprinting has. I think we demonstrated that indeed the amount for a particular gene is really important in the brain. We found many new imprinted genes, around 40 new imprinted genes, and so we can do the experiment for several of these genes. We're also trying to see whether some of the new imprinted genes identified in the mouse are also imprinted in humans. Q: Because different mammalian species have varying imprinted genes? We actually don’t know. Genomic imprinting in the mouse has been highly studied thanks to the ease of doing experiments in this system, but there has not been any systematic study of human imprinting the way we did with the mouse yet. Unfortunately, I have to say it's extremely difficult to do these studies in other species. Q: These genomic imprints are very stable, molecularly speaking, right? Yes, genomic imprinting is a stable epigenetic mark. Any disruption in the germline or in the parents or the grandparents would be inherited across generations. Q: What can induce those disruptions? This is an area of great interest. You had earlier pointed to germline exposure to endocrine disruptors. I think that it's a valid hypothesis that remains to be fully explored. And in addition to endocrine disruptors maybe stress or other environmental exposures could affect imprinting. These are questions that we've not been able to address so far because we first needed to know precisely what is the actual imprinting of different genes in different brain areas. If we know the normal imprint then we can try to understand what is dysregulated in specific disorders and what are the agents that trigger those anomalies. The problem that we are facing with studies specifically in the area of genomic imprinting is that they are extraordinary expensive, both for animal models and also in humans. In humans, it’s particularly difficult to obtain brain tissue, which must be post-mortem, but also the genomic information about the parents. It’s a huge undertaking. But I would love to see this sort of exposure-related work move forward. Q: Back to a basic molecular question. One thing that is interesting about the imprints is that they can survive reprogramming events. Do you have an idea of why and how that is? Well, there's a little bit of a paradox and that's not completely understood. On the one hand, imprints are very labile. It is well known, for example, that in an in vitro culture, genes can lose some of their imprinting status. This is a problem with in vitro fertilization where abnormal genomic imprinting can arise when you put cells or embryonic cells in culture. On the other hand, when at fertilization and during germline formation, the epigenetic marks on the chromosomes are reset in the entire genome except for imprinted genes. So on the one hand, imprints are very labile, on the other hand, they seem to be resistant all sorts of reprogramming affecting other chromatin modifications. The idea is that there are specific proteins or protein complexes that protect the methylation or other imprinting marks on imprinted genes that do not exist in non-imprinted genes. So some of these proteins have been identified and specific sites that they recognize also have been identified. In fact, some of the new imprinted genes we found have those specific sequences that are recognized by the protective proteins. Q. Are those proteins themselves environmentally vulnerable in some way? I don’t think that has been studied in depth yet. These proteins are part of large macro-molecular complexes that aggregate around specific sites and they are one component out of these gigantic complexes. So to study them is not easy and studying environmental exposure is probably a bit tricky, but I'm sure at some point somebody would be looking at this. Q: I wanted to ask a bit more about the effects you see in early brain development when imprinting goes awry. The study we performed was to identify imprinted genes in the cerebellum because that's a great place to start with, as there are relatively few cell types in this brain region. Moreover, the cerebellum is the only structure in the brain to undergo its development after birth. So we can obtain the equivalent of an embryonic brain tissue and then an adult tissue in a postnatal mouse. Our study started in the cerebellum but we then expanded it to the rest of the brain. In the meantime, and in collaboration with electrophysiologists, we are looking specifically at the maturation of neuronal function and at a particular step of brain development that corresponds to what is called a critical period. This is a period in which the neuronal connections are being refined: it's a very transient period but that is absolutely essential for the proper brain function of the future adult. We are looking at whether genomic imprinting has a particular role in the refinement of neuronal connections, it's a work in progress right now. Q: How many imprinted genes do you think there will end up being in humans? And how many do we know about now? Likely we will find over hundred, maybe several hundred imprinted genes. Now we can identify less than a hundred. In the mid-'90s there was a flurry of papers predicting genes that were imprinted based on computational prediction and most of these predicted genes ended up being wrong, so people need to do the experimental work. I think that's what we did and some of the genes indeed are associated with mental disability or autism or maybe schizophrenia, but I think a lot more work has to be done. I think there was this huge excitement about genomic imprinting and all sort of interesting ideas about the maternal versus paternal contributions to the brain, but these were theories that need to be verified. Q: I wanted to ask about the study by Azim Surani looking at the methylation events in the early germline and pre-implantation embryo. The human germline is very robust in its ability to reprogram, but there are these "escapee" genes that they found that seem to relate in part at least to neurodevelopment. Do you have any comments on that and if that has any relationship at all to the work you do? I think these are very interesting studies and one will have to look at what's going on specifically with these genes, whether there's disruption related to a specific disorder, and whether this is related to genomic imprinting or other type of epigenetic changes. There has been also other studies by several groups that showed that some marks are maintained in germ cells. What is the significance of this? Is this random? Is it regulated? That's a little bit unclear. But those are fascinating studies. This is new territory in research, the dots need to be connected at some point and that's going to take a little bit of time. Q: Thank you much for your time, I'm so grateful for the important work you are doing.